A very traditional pie hailing from the southern part of the United States. 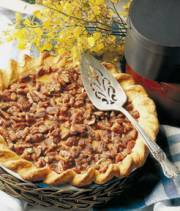 This delicious Sweet Potato Pie topped with pecans is a wonderful dessert for a holiday or for any special occasion. A lovely dessert for Kwanzaa or Juneteenth Day. Heat oven to 425 degrees F (220 degrees C). Beat softened cream cheese with electric mixer until fluffy, then beat in sugar. Reduce mixer speed and add eggs, one at a time. Beat in mashed sweet potatoes (or yams), evaporated milk and pumpkin pie spice. Pour filling into unbaked pie shells. Bake pies 30 to 35 minutes until edges puff, crust browns and custard is set. Meanwhile mix together, the coarsely chopped pecans, the brown sugar and the melted butter. Pour over top of pie and return pie to oven for 7 to 10 minutes longer until topping is golden brown and crisp. Cool pies on rack completely. Garnish with whipped cream (optional). Store any leftover pie in refrigerator. Makes 2 (9-inch) pies. Each pie serves 8, approximately.